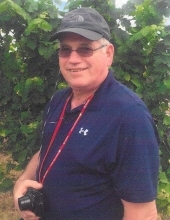 Michael Clinton Schmitt peacefully passed away on April 12, 2019 at home. Michael was born in Cottage Grove, Oregon, on June 17, 1956 to Richard and Genera Schmitt. Eventually the family moved to Idaho Falls but he always had a very special attachment to Cottage Grove, spending many summers with his grandparents. He graduated from Skyline High School in 1974. During high school he worked at Smittys where he developed his culinary skills. Michael studied Computer Science at Idaho State University. While a student he started working at Me And Eds Pizza delivering pizza and eventually moved into management. He managed stores in Pocatello, Idaho Falls and Chubbuck for 10 years until the stores closed. Michael would eventually find a passion for breeding and showing dogs. He started with Cocker Spaniels and moved on to Field Spaniels and Clumber Spaniels, and was the first person in the history of the breed in Field Spaniels to win a Best In Show, not once but several times. He also had the # 1 Clumber Spaniel in the country. He was a member of the Professional Handlers Association and showed many breeds traveling coast to coast and Asia. While not traveling and showing, he managed K-9 Kuts grooming shop. He was offered the opportunity to move Portland, OR and became an AKC Licensed Show Superintendent and was employed by Onofrio Dog Shows until his diagnosis of Multiple Myeloma and returned to Pocatello. He was a past President of the Pocatello Kennel Club and a life time member. His love of travel took him on a river cruise to Germany, Switzerland and on to Rome. He loved Hawaii also. He was a meticulous gardener and a master at installing drip systems. Michael will be greatly missed by his sisters Teresa Browning (Mike), Karen Stockdale (Ken), and a brother Mark Schmitt (Kami) and numerous nieces and nephews and his best friend, companion and caregiver Carla Nickerson and her children and grandchildren who called him PaPa Mike. Honoring his wishes he was cremated and there will be no services. A private celebration of life will be held at a later date. Please share memories, photographs, and condolences on Michael's tribute wall. To send flowers or a remembrance gift to the family of Michael Clinton Schmitt, please visit our Tribute Store. "Email Address" would like to share the life celebration of Michael Clinton Schmitt. Click on the "link" to go to share a favorite memory or leave a condolence message for the family.